At last Neurology Consultants are eventually looking to arrange plans for Functional sufferers, plans that are not just to do with the brain, but to help us reclaim the workings of our own bodies. Occupational therapy is something I have received myself, and though I am excited that this is going to come in to be offered to more sufferers, I didn’t have a great experience myself. There needs to be a structure agreed between the Neurologists, and the Occupational therapists. My guy didn’t know what to do with me, didn’t dare to touch me. We spoke mostly in all my sessions, and I did not need that as I talk with a Neuro Psychologist! 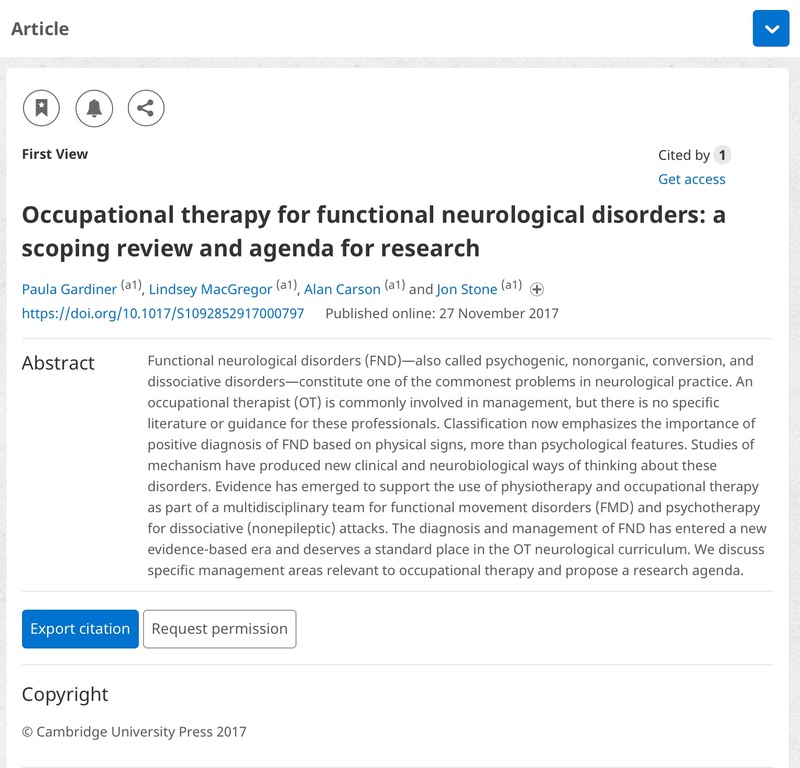 So I really hope that there is some real communication between Neurology and Occupational therapists, because we need to be helped with our movements, not have someone who doesn’t know what to do for you! Though on the positive side, here is the article I found that talks of the start of looking at offering patients a course of occupational therapy. It may take some time to get this set in place, and for all Consultants to be able to offer this help to patients. But it is a start, and shows there is constant research looking to help us. This shows we are not forgotten, that research is ongoing!